ARAB AL-NAIM—Large villas are sprouting up, roads are being developed, street lamps are being erected and sidewalks are being installed. 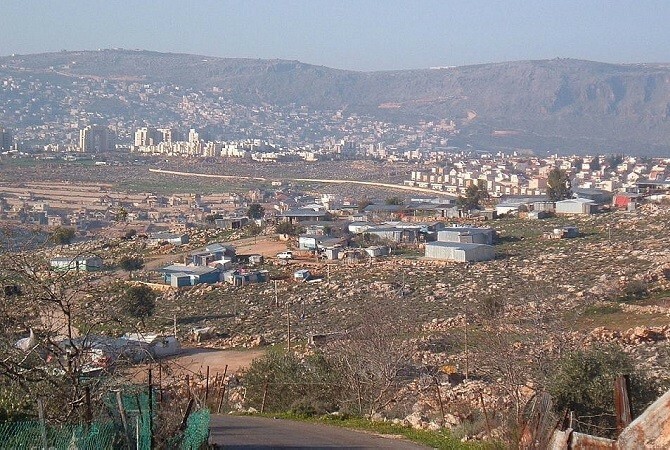 Arab al-Naim, a small Bedouin village situated on a hill in the Galilee between Karmiel and Sakhnin, gradually is changing from a collection of tin shacks into an organized and planned development. Many of the village’s 1,000-odd residents, a number of whom have served in the Israel Defense Forces and the Border Police, credit Prime Minister Benjamin Netanyahu with a large part of the village’s transformation and say they intend to support his Likud party in the upcoming national elections on April 9. In 1999, Israel, under Netanyahu’s leadership, recognized Arab al-Naim after years of neglecting the village and attempting to relocate its residents, who all belong to the same Naim family. “I officially declare here that Arab al-Naim will be a community with equal rights in the State of Israel,” Netanyahu said in a speech at the time. The Jewish state, with Netanyahu at its helm, has also more recently granted building permits to the village’s inhabitants and started to invest tens of millions of shekels in it, including for essential services and infrastructure. The families in Arab al-Naim have slowly transitioned from dilapidated tin shacks into new homes. Only 20 of the more than 150 families in the village still live in shacks, according to local authorities. In the last national elections in 2015, 77 percent of voters in Arab al-Naim cast ballots for Likud; in 2013, approximately half did so. In comparison, the overwhelming majority of Bedouin voters in 2015 cast ballots for the Joint List, a coalition of four Arab-majority parties; in many Bedouin villages, the Likud received less than 1% of the vote. A recent Brookings Institution poll found that only 4% percent of Arab-Israelis intend to vote for Likud, while the overwhelming majority plan to cast ballots for one of the two major Arab electoral slates, Hadash-Ta’al and Ra’am-Balad. A wide spectrum of Arab al-Naim’s inhabitants said the quasi-constitutional and controversial nation-state law, which Netanyahu has strongly supported, has not changed their perspective on the prime minister. The nation-state law, which the Knesset passed in a 62-55 vote on July 19, enshrined Israel as “the national home of the Jewish people,” recognized Jewish holidays and days of remembrance, and declared Hebrew the state’s sole national language. “I was equal before and I am still equal,” he said, speaking from his porch. Many Arab- and Jewish-Israeli leaders have panned the legislation, with some going as far as to call it “evil” and “racist.” Tens of thousands of Israelis also protested against it, in the weeks following its passage in July and August 2018. But not all of the Arab al-Naim’s resident said they planned to cast ballots for Netanyahu. An older resident, who declined to identify himself other than noting that he had served in the IDF for 19 years, said he and his immediate family will vote for retired IDF general Gal Hirsh’s Magen party. The only campaign poster in Arab al-Naim, which is located on the street of the older resident’s home, is a picture of Hirsh and Magen’s logo. No major polls have shown that Magen will earn enough votes to pass the 3.25% minimum threshold to enter the Knesset. Nineteen of the 28 Arab al-Naim residents with whom The Times of Israel spoke on Wednesday said that they intend to vote for Likud. Three said that they will cast ballots for Magen, and the remaining six said they will not take part in the elections. Fifty-eight-year-old Yousef Naim, a construction worker, was one of the handful who pledged not to vote next month. The prime minister stated in an Instagram post in March that Israel is “not a nation-state of all its citizens,” but “the nation-state of the Jewish people alone.” He was widely criticized for the remark. Thabet Abu Rass, who hails from a Bedouin family and has closely observed Arab-Israeli society for decades, said that the primary reason many of Arab al-Naim’s inhabitants have backed Likud is their community’s tribal background. There are several Bedouin villages in northern Israel, but none of them voted for Likud in the 2015 elections to the degree that Arab al-Naim did. Abu Rass also contended that leaders in villages like Arab al-Naim determine whom they want residents to support based on deals they make with politicians who visit them. Nimer, the chief of the local committee, vehemently pushed back against Abu Rass’s assertions, arguing that all residents vote on their own conscience. “Everyone votes for whoever they want to here. No one tells anyone how to vote,” he said, insisting that many residents supported Likud in the last elections because of “the great situation” the village has experienced under its rule. Back in the center of Arab al-Naim, an 18-year-old resident of the village, who works at a local farm, tried to explain why he supports Netanyahu.